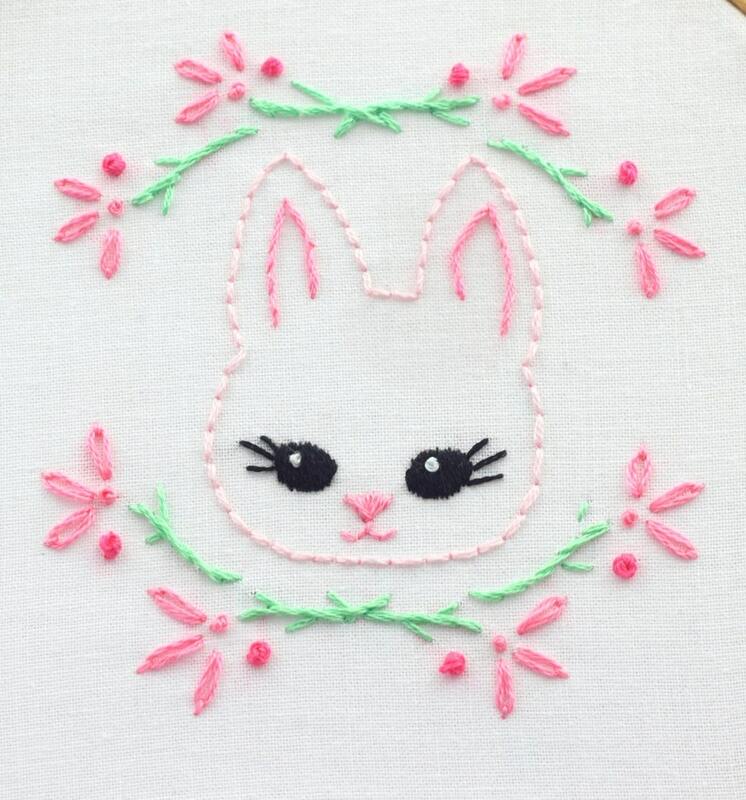 Baby girl embroidery design. This hand embroidery pattern set is filled with beautiful and feminine baby inspired motifs. Stitch something for the sweet baby girl in your life or as a gift for the mommy-to-be. These motifs are perfect for stitching on baby items such as clothes, baby bibs, receiving blankets, nursery pillows, nursery linens or diaper bags. There are 11 pages of motifs. These include bunnies, lambs, kitties, crowns, flowers, text and borders. This pattern packet is available for instant download. As soon as your payment is complete, the pattern may be downloaded and you are ready to print it and transfer it to your project. 1. Using lightweight fabric, tape the pattern (face up) to a flat, smooth surface and tape your fabric over the pattern. You should be able to see the pattern through your fabric. Use a washable transfer pencil or erasable marker to trace the pattern. For heavier fabrics, you will need a light source to see the pattern. You could tape the pattern and fabric over a light box or onto a window. 2. Using tracing paper (sometimes called embroidery tracing paper or dressmaker’s tracing paper), tape your fabric to a hard, flat, smooth surface. Cut a piece of tracing paper that is an appropriate size for the pattern. Place the tracing paper (carbon side down) onto the fabric where you want the design to be. Set the pattern on top of the tracing paper with the right side of the pattern facing up. Make sure the three layers (fabric, tracing paper, and pattern) are in place and then tape the pattern edges down to the fabric so that everything stays securely in place. Firmly trace the pattern with a pencil, a dry ballpoint pen, a tracing stylus or an embossing tool. I love these designs and they are super easy to do! Cute little patterns and love the PDF instant gratification! Due to the digital nature of the product, if the files have been downloaded - the sale is final. *I provide original patterns and printables. *These patterns are in .pdf format and are available for instant download. As soon as your payment is complete, the pattern may be downloaded and you are ready to print it and transfer it to your project. *These patterns and printables are for your personal use only and are not to be distributed to others, sold or used on items to be sold. Digital Elements: Digital elements may be used only by you for your personal and limited commercial projects. creating cards, invitations, labels and tags, for scrapbooking and on your personal websites and blogs. Limited commercial projects are restricted to your small business where you are hand-making your products for sale yourself. for resale or redistribution as is, for use by third party printers such as zazzle, spoonflower, cafepress or similar enterprises.